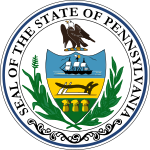 The 1831 United States Senate special election in Pennsylvania was held on December 13, 1831. George M. Dallas was elected by the Pennsylvania General Assembly to the United States Senate. The Democratic-Republican Isaac D. Barnard was elected to the United States Senate by the General Assembly, consisting of the House of Representatives and the Senate, in December 1826. Sen. Barnard resigned on December 6, 1831, vacating the seat. ^ a b "U.S. Senate Election - 13 December 1831" (PDF). Wilkes University. Retrieved December 21, 2012. ^ "BARNARD, Isaac Dutton, (1791 - 1834)". Biographical Directory of the United States Congress. Retrieved December 21, 2012. ^ "PA US Senate - Special Election". OurCampaigns. Retrieved December 21, 2012.